We rate this as four bottles owing to its combination of good location, lively atmosphere and acceptable facilities backed up by recent reviews. Petrolheads prepared to spend some money on private camping with its own party atmosphere. None, other than the pricing. Experienced operator with site at good location. Classic location close to both the track and the village. Pitches can be tight size wise and can vary. Situated between Houx and Houx Annexe. Fairly large , secure campsite very close to the track. Populated by well behaved middle aged men most of whom traveled down in expensive cars. Very noisy on Thursday night and obviously throughout the race due to its proximity to the circuit. How do regular boys sleep !!???? Was reduced to sleeping in the motor in an attempt to get the noise leves down! As someone has already mentioned the showers are kept mopped clean after each use by a member of the Thomas Cook team, and for a campsite the loos were kept in good nick. Marquee was not not big enough to accommodate everyone during the rain on Thursday eve who were crammed in trying to watch the footy. Lockers available at reception to lock car keys/valuables in if required. A lot of the site is under beech trees and is fairly well covered, which helps when trying to erect a tent in the pouring rain! exit the camp, turn right, 8 mins walk to the tram outside the sports arena, for the drivers parade on Friday. To some people it maybe pricey but it's Le Mans and we can personally justify spending the money. It is dearer than the ACO campsites. They have on site caterers who charge a little more than I would pay but it's convenient. Portions could be a little more generous. The pitches could do with being bigger for what you pay. Biggest is there luxury pitch which is 4x10 metres. Enough for a decent size tent and car. The atmosphere on Sunday night in the marquee is awesome with the band and beer flowing. Pre erected 4 person tents are small and I don't recommend them for 4 biggish blokes. I stayed here in 2011 and found it very good although I believe it is expensive (we got a discount as one of our group members worked for Thomas Cook Sport). Location: Very good as the site is positioned in a wooded area in between Houx and Houx Annexe. The entrance is just opposite the footbridge that takes you over the Bugatti circuit so you can get to The Village within about a five minute walk or Tertre Rouge in about fifteen minutes. The tram is also only about ten to fifteen minutes away. Security: Excellent with a friendly but burly security guard or two on the gate at all times and you are checked that you have the correct pass every time you access the site. Permanent fencing surrounds the site. All the staff are very friendly and helpful. Facilities: Very good. The beer tent could have been bigger but the bar served cold beer etc and the race coverage was always shown on the big screen. Food was good quality but not cheap. There was the obligatory live band on some nights as well. Showers were hot and kept immaculately clean as were the wc’s. We opted for pre-erected tents which I wouldn’t bother with as they were so small but pitch size was good. They offer excursions to Mulsanne or Arnage although we didn’t take part in these. Typical Camper: The type of people in the site were quite civilised, friendly but certainly out to enjoy themselves so atmosphere was good. Its mainly used by 30-50 year olds mostly with very nice cars. The Thomas Cook Sport Village (formerly Airtrack Village) has become a highly regarded base for race goers. 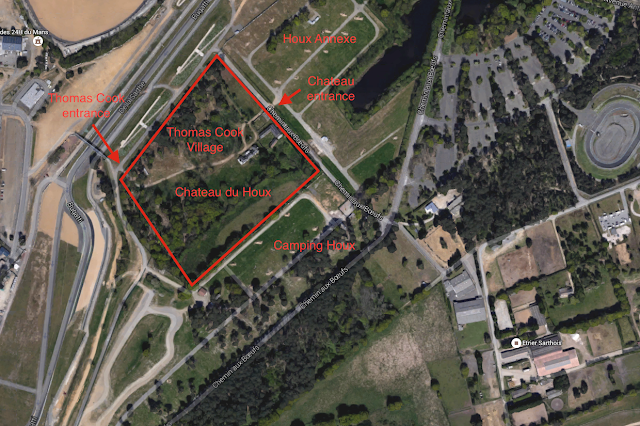 With camping and caravan options to choose from and a great location directly opposite the Paddock, the Thomas Cook Sport Village allows you to setup camp for the 2016 Le Mans 24h. The site has a festival feel to it and in the heart of the site you will find our bar and catering marquee - The Airtrack Arms, featuring a large screen to bring you coverage of the race and other sporting events during your stay at Le Mans. 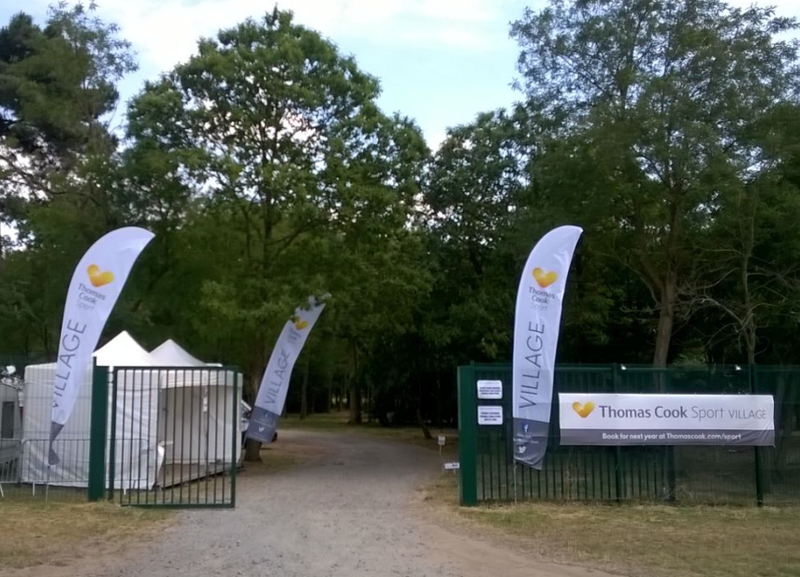 On your arrival at the site you will be greeted my our friendly team at our reception, open 24 hours, and taken to your pitch, the staff at Le Mans will be on hand throughout your stay to ensure that your visit to Le Mans 24h is a memorable one.